Bose is finally ready to join the smart speaker revolution with its new Home Speaker 500, the company announced today. This $399 or £399 (about AU$550) smart speaker will have Alexa available from the start, and then add support for AirPlay 2 and Google Assistant later down the road. 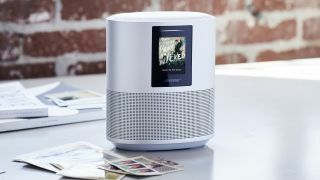 What sets the 500 apart from the slew of smart assistant-equipped speakers on the market (besides its sticker price) is that it features a small screen that will display album art and the integration of Bose’s proprietary mic technology found in Bose headsets and headphones that will allow the speaker to hear commands better over loud music. The speaker stands at a fairly stout 8 x 6 x 4 inches (H x W x D) and uses two custom drivers pointed in opposite directions that, according to Bose, helps the speaker deliver true stereo separation from a single unit by bouncing sound off surrounding walls. That’s a big claim, obviously, but one that could be feasible given the brand’s historical contributions to audio development. Bose might very well have cracked the code when it comes to unibody stereo separation but, unless people are able to hear it for themselves, it might be hard justifying the sticker price – what amounts to be the cost of a Google Home, Amazon Echo and Sonos One, combined. To coincide with the announcement of the Bose Home Speaker 500, Bose has also announced two new soundbars that will also come with smart assistant integration – the Bose Soundbar 700 and Bose Soundbar 500. Like the Home Speaker 500, the soundbars will launch with Alexa support and be joined by AirPlay 2 with Siri and Google Assistant later. Setting the soundbars apart, however, is a slightly different technology: Bose PhaseGuides. Sounding like something ripped from Star Trek's holodeck, PhaseGuides use the acoustics of a room to "place discrete sound in places where there are no speakers" – which sounds like Dolby Atmos without the overhead channels. The soundbars will join the Home Speaker 500 on store shelves starting in October and will rock a complimentary price of $549 or £499 (about AU$750) and $799 or £799 (about AU$1,089), for the Soundbar 500 and the Soundbar 700, respectively.